Our magic spring has continued with no wind. A magnolia flowering season with a bad weather factor of only two short lived storms is a good season here. Though I am told that in the south of the province, a series of severe frosts have taken out most of the season’s display. In the deciduous magnolias, Burgundy Star flowers on and is still looking good whereas Felix’s series (Iolanthe et al) are now past their peak. Iolanthe will continue on for weeks yet, but not in her full glory. Serene is still opening. This is one variety that we have been surprised has not had more recognition overseas. Good pink colour, flower form and size, flowers later but still on bare wood and a tidy, well behaved tree. Being liliiflora x Mark Jury, it has reasonable hardiness. It is full on michelia season. Fairy Magnolia Blush continues in flower and the lollipop row on our frontage is looking good. They were planted in quite harsh conditions (compacted old driveway, in some cases) about five years ago but haven’t minded a bit. I give them a light clip twice a year to retain the shape but otherwise they are left entirely to their own devices. Mark’s Honey Velvet is in full flower. This is a Magnolia dianica (syn: Michelia yunnanensis) selection and every nurseryman, woman and dog has their own selection made now, so easy is it to raise seed. All we can say about Honey Velvet is that it has a honey cream coloured flower (rather than white) of good size, wonderful bud set, longer flowering season than some and good dark foliage. And it does not appear to defoliate in a cold, wet spring as some of the dianicas do. Other than that, we can’t get too excited about what is just a species selection. We can and do get excited about the michelia breeding programme and the increasing range of deeper flower colour and size we are starting to see as Mark continues down the track of ever more complex downstream crosses. We can see real progress here but that, alas, is all we can say publicly. It was a bit of a red letter day here yesterday as Mark decided that he was happy to give the go ahead on another deciduous magnolia. Mark has only ever named three magnolias in a breeding programme which has built on his father’s work and thus spans close to five decades now with many hundreds of magnolia plants raised. So to make the decision on a fourth one is no light matter. It is still a long haul from here through final trialling and production before it ever gets anywhere near the marketplace but all we will say officially is that this one is not red. 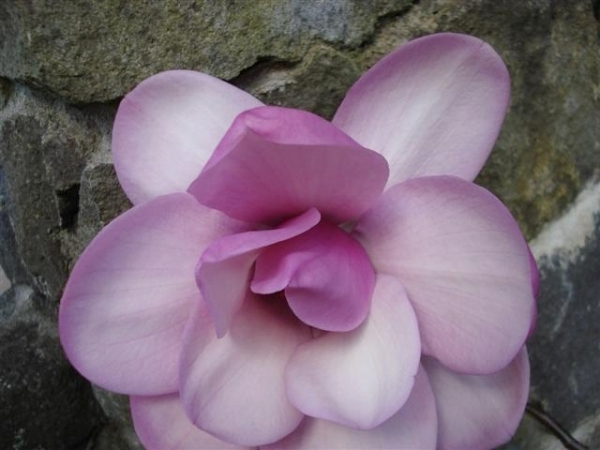 This entry was posted in Magnolia diary and tagged Burgundy Star, Fairy Magnolia Blush, Felix Jury, Iolanthe, Jury magnolias, Magnolia dianica, Magnolia Serene, Michelia Honey Velvet, Michelia yunnanensis, Michelias, New Zealand magnolias on 9 September 2009 by Abbie Jury.